Bartlett Durand, who is Gary Zimmer’s son-in-law and owns Black Earth Meats, was also in the last Sky Full of Bacon podcast, The Butcher’s Karma. Gary Zimmer’s books are here and here. Otter Creek Farms is here. Midwestern Bio-Ag is here. I met Gary Zimmer and Bartlett Durand on this trip, and Bartlett again here, but even before then, I liked their cheese a lot. As that notes, you can find Otter Creek cheeses at the Logan Square Farmer’s Market and Provenance. Lately I go to a lot of restaurants with professional representation— I don’t mean lawyers, I mean a PR firm. I don’t have a problem with that, he said as he nibbled on leftover mignardises from Tru last night, but I do like to get back in touch with the people on occasion. Here are two restaurants which are far from having much in the way of marketing support (though one has, at least, some professional logo design, and the other has a very nice painter). They are trying to get by on merely doing things well and hoping to attract foot traffic. Unfortunately, what they also have in common is a near total lack of media attention of any form (including LTHForum). So please notice them and give them a try. 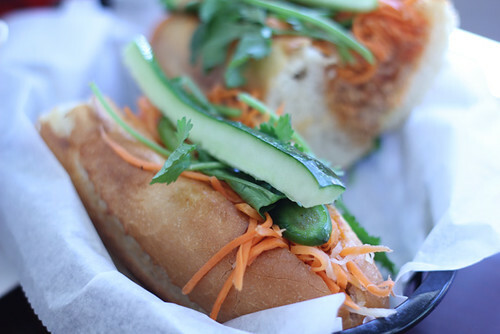 Banh Mi & Co. suffers the problem a number of restaurants have— how do you make it if you’re doing the same thing as a really well-liked place very close by? 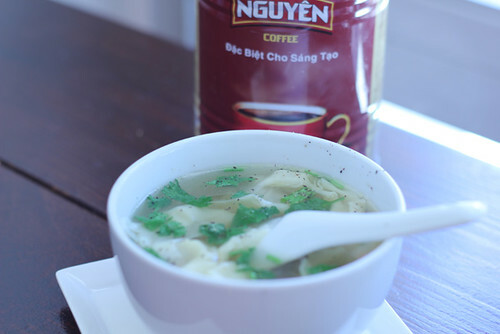 Located at 3141 N. Broadway, it’s the other banh mi, or Vietnamese sandwich, spot in that area since Nhu Lan Saigon Subs, a branch of the widely-liked Lincoln Square spot opened on Belmont. 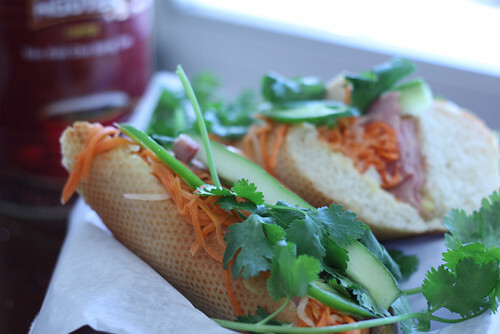 Banh Mi & Co. doesn’t have all of the authentic funk of Nhu Lan, with a thinner menu of less exotic things, and maybe purists would quibble at the bread or something as not being quite the perfect banh mi bread, but what they do they do well and by hand, and they deserve a look. It’s run by a couple— it looks like he’s Vietnamese and she’s maybe half, or she could be Mexican for all I know— who apparently (assuming they’re the owners) have other shops, although every time I’ve been in there they’ve been there, so I guess this is their flagship; they don’t act like people who have anywhere else to be. If you talk to her she’s quick to tell you how they make things themselves. I really liked the classic banh mi with the pork pate they make— not as funky as Nhu Lan’s, but this is a great lightish sandwich, satisfyingly meaty yet with the crunch of vegetables. I was a little less personally enamored of the “meatball” sub, which turns out to have something like a pork ragu in it, but if that sounds good to you, eating basically a bolognese sauce sandwich, go for it— it actually compared well to a wild boar sloppy joe that Longman & Eagle used to serve. and take your picture doing it. 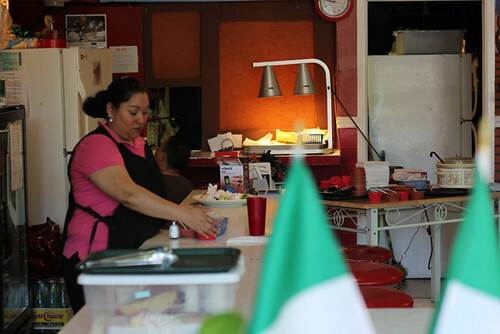 Like Birrieria Zaragoza on the south side, Taqueria Mi Guadalupe took over an old diner counter spot but mainly serves Mexican food, comida-style (so you get a bowl of very pleasant vegetable noodle soup at the start). 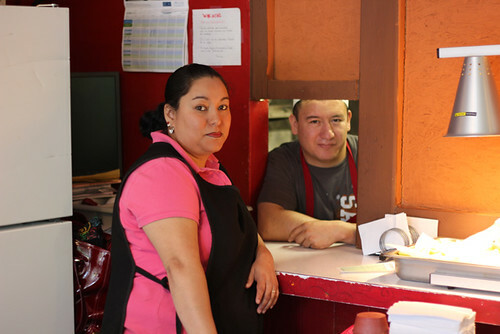 When I asked if they had a pastor cone, Armando shook his head sadly— the health inspectors wouldn’t let him have one. So he does what a million places do— fries pastor in a pan instead of cooking it on the cone, gyros-style— but unlike all the others, he carefully browns it to get as close as he can to the crispiness of real pastor. I think that’s pretty cool. Of course, once I had taken so many pictures they wanted to know where they could see them. Facebook? Well, yes, I guess so. 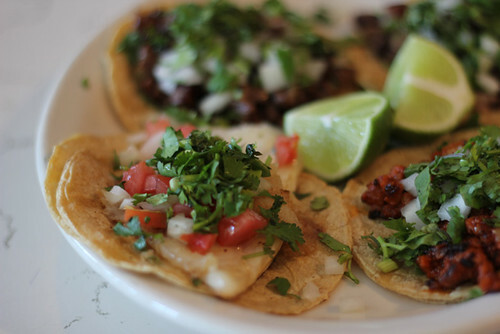 So not only did I enjoy their food and write about it… I’m now friends with them on Facebook. So they can come to this piece… and meet the couple who run Banh Mi & Co. … and the guy who tweeted and blogged the picture of me taking pictures of the Banh Mi. I think that’s pretty cool, too. Steak at Goosefoot, which is not X. 1) X’s new chef threw together his first menu in a hurry, but he’s really getting ready to stretch his wings in the next couple of weeks with his new menu. 2) X has hired a new pastry chef. 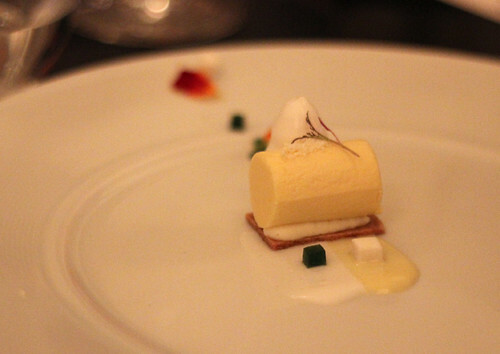 3) A review of X just came out, which wasn’t that wild about new chef’s food or desserts. Well, good thing that’s exactly what they’re fixing, isn’t it? The problem is that, of course, this is the only review new chef will get from that publication for some years. It’s no one’s fault, but it’s a fact that long after things have changed considerably at X, you’ll still be reading about the problems of early 2012. On the other side of things, on Thursday I published the story that erwin, an influential restaurant of the 90s, was closing. A few hours later, everybody had rushed out stories about grand, beloved old erwin. Lots of ink for an old favorite, we sure will miss ya, pal. But when was the last time any of them had written about erwin? Phil Vettel reviewed it twice— the year it opened (1994) and the next year, to give it an upgrade from two to three stars. Then… 17 more years without a word. Chicago magazine’s two-line blurb says it’s an update, but to judge by what it says, it could be from any one of those 18 years. I admit, I know exactly when I last went there— 1998, it was our last meal out before our first child was born. 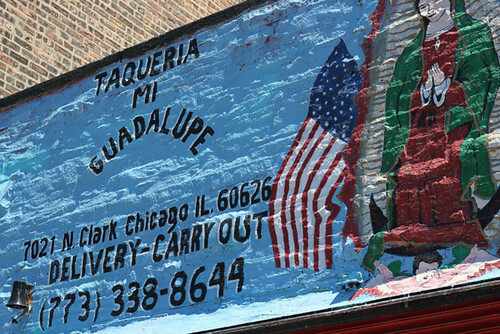 They could have been roasting whole humpback whales or spontaneously generating food out of dark matter in that Halsted storefront, for all anyone in the food media world apparently knew what was going on in there. I don’t have an answer for this problem— there simply isn’t the revenue to afford all the reviewers a chance to eat all the meals to cover the scene in truly conclusive depth, even if that were humanly possible. 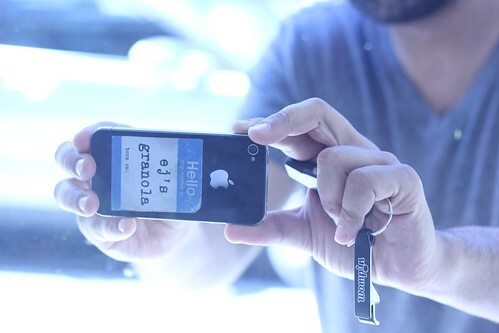 Citizen media like Yelp or LTHForum are, obviously, one answer that offers datapoints on an ongoing basis, but with their own problems of quality and credibility. I just bring the issue up to say it’s been on my mind… and so when I talk about some things that went badly wrong at what I nevertheless think is one of the best restaurants of the year, recognize that I’m writing in the context of a single visit on a particular night and six months or a year from now, much of this will not be true. At least, I hope not by then. Balena and Nellcôte seem like twins to many reviewers— big, chic Italian spots which opened within days of each other, represent the second projects of well-liked chefs (Chris Pandel and Jared Van Camp, respectively)… and were reviewed as having service and consistency issues early on (see here and here, for example). The result is, for all that I’ve covered them, I haven’t had a professional reason I had to eat at either one and as others have raced to them, I’ve been happy to give both of them some time and work out the issues. But I did get toone of them, Balena, a couple of weeks ago with my family. (Some of the photos, incidentally, are by my younger son, who’s now started photographing food when we go out— where’d he get that?) And at its best Balena is fantastic. A rhubarb white pizza with pancetta my older son ordered had all the virtues of housecured meat and all the virtues of hyperseasonal farmers market produce. The bread service— one of those ones everyone grumbles about because it’s charged for, not free— was utterly worth it, beautifully-textured breads with interesting flavors like mint-pea, and an interesting variety of things to eat on them. The pastas had an admirably toothy texture. 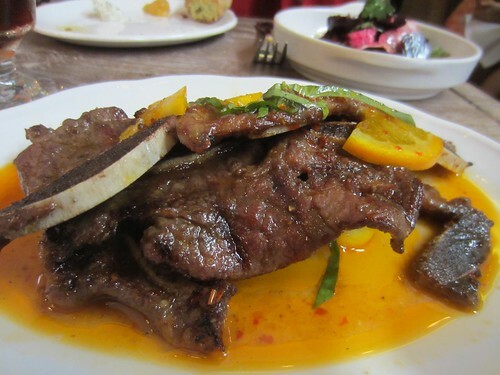 The spicy burnt-orange-flavored shortribs seem to have wandered in from a Chinese restaurant, not an Italian one, but were so good you didn’t quibble. 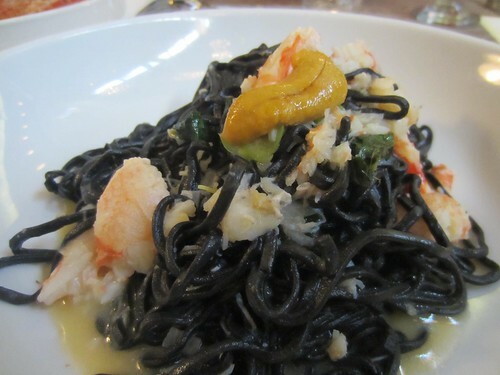 Unfortunately, one of our choices— an acclaimed dish with squid ink pasta— turned out to be botched in the kitchen, at least, I can’t believe it was meant to be so puckeringly lemony. After a few bites, I gave up on it. 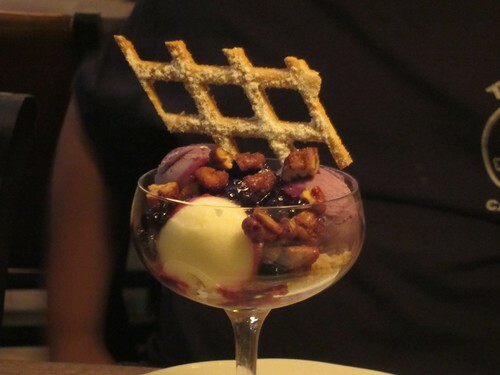 And there was worse to come when dessert came: sundaes are the main focus of the dessert menu, sundaes in tall, somewhat precariously balanced dishes. Mine seemed to be set down at an alarming angle for the height of the glassware perched on that plate, my son’s came in even for a landing even more acutely… and toppled over straight into his lap. So yeah, I’d say there are some issues to be worked out. In telling this story, though, the real point is that while they bungled some things, they also did exactly what you should do about it. First off, points to the waiter for noticing that I just wasn’t eating my pasta dish and, upon learning the reason, offering instantly to remake it or take it off the bill. (Since I was eating my son’s pasta for him, I did the latter.) 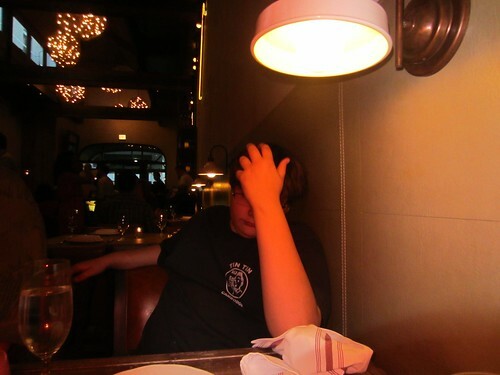 You can say any waiter should notice if you’re not eating your dish, but… well, you can say they should. 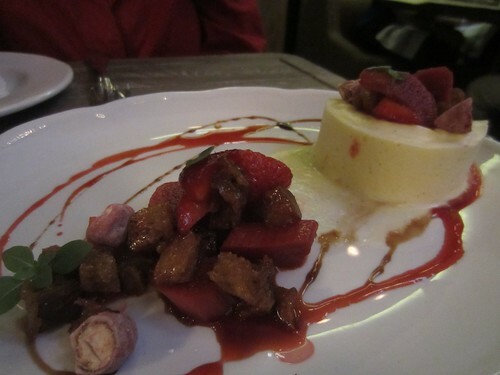 As for the lap sundae… they hurried out with not just a replacement but even more sundaes and one of the few non-sundae desserts, a semifreddo with fresh spring fruit (very similar to the Key Ingredient dish Amanda Rockman made, in fact). Unfortunately, that presented its own issue in that, next to the sundaes, the semifreddo, delicate and tart, was like a ballerina dancing around hippos. I kind of think the whole sundae-focus thing was an idea that came up in some meeting and maybe should have been left there; Rockman is a ballerina among pastry chefs, and just doing ice cream has her with one leg tied down. 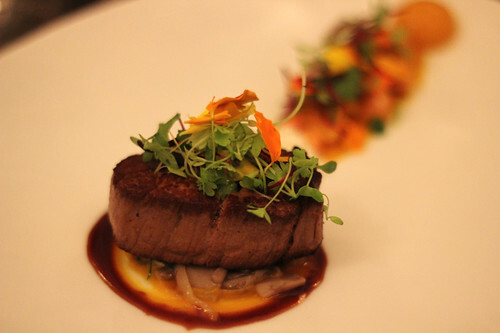 Speaking of old and new menus, before going to Goosefoot I happened to read an LTH post that said the menu there hadn’t changed with the seasons since it opened. This instantly bummed me out a little, which is absurd, because it’s not like I had been there before— it was all going to be new to me. But I didn’t like hearing that it was static; we expect every restaurant to follow the farmers’ markets now, week by week. I wanted it to fit my expectations of what they should be like. Spirits were buoyed somewhat by learning that we’d get to try a couple of extra courses from the new menu, set to launch shortly. And it is worth noting at the end that our entire party pretty much agreed that both of the new dishes we tried were in the top 3 or so of the night, even as possibly-not-finalized dishes, and Goosefoot may be an even better restaurant in a month. So again, we’re in a situation where the reviews that have come out may or may not represent what this restaurant really is even a short time from now. Goosefoot’s story is the foodie fairy tale of the moment; chef Chris Nugent and his wife Nina opened this neighborhood fine dining spot amid a fair amount of skepticism about whether they could command a fairly high price point (a $90 tasting menu, though it’s BYO which makes it more manageable) in this location amid Greek coffeehouses and Bosnian soccer bars. In fact, they were pretty fully booked from the start, but what really packed the place was Chicago magazine calling them the best new restaurant of the year. And it’s easy to see why they picked it; in a year of mega-openings (like Balena), this cozy little labor of love, from two just plain nice people, is immediately endearing, fine dining’s answer to the similarly lovable Pleasant House. One notion that came from a couple of the reviews— both Michael Nagrant and Mike Sula said some variation on this— was that Nugent’s precise and unabashedly fine-diningy food needed to loosen up, rock out a little. In this case I reacted against this expectation when I read it— why should we want a guy pursuing his life’s dream to be anything else other than who he is?— but I understood it a little more a few courses in. I ate at Sprout recently under its new chef, and the food there was flamboyant, the usual sauce-schmear on the plate being made out of black squid ink, the better to show off the colors on the plate, like a blacklight poster. Goosefoot’s is pretty much dead opposite of that— at first glance all the dishes are arranged in very much the same way, a stripe of tiny, neatly arranged food bits. You could wish for a dish that smashes the visual paradigm and gets funky on the plate. But you’d still be wishing for the wrong thing in the wrong place, I think. It takes a couple of courses to adjust to Nugent’s scale and precision, to shrink your own preconceptions like the ship in Fantastic Voyage until the tiny squares on his plates are the size of boulders in a lake of sauce, and the variations on his theme from dish to dish ring out as big as cathedral bells. 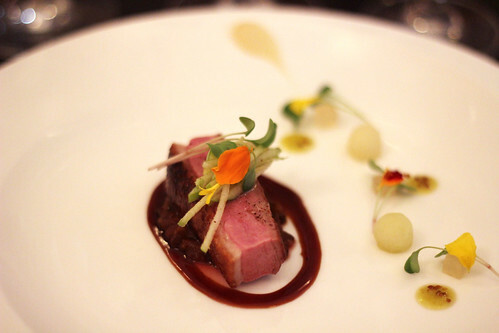 The duck— one of the new dishes— may look like duck breast in the usual brown veal stock demiglace, but the beluga lentils it sits on electrify your mouth with bright pickled ginger flavor, and the nondescript off-white ball on the plate turns out to be an equally mouth-jumpstarting compressed apple. 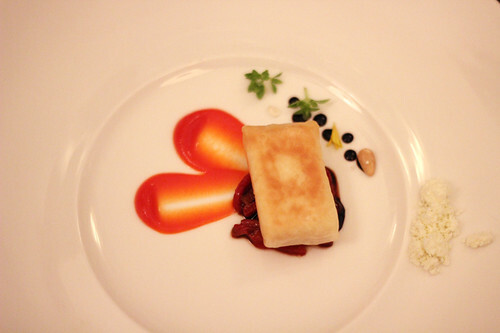 The square of goat cheese in phyllo dough (another new course) reads like an appetizer, not a fine dining course, but then you pick up a tiny bit of fresh basil as you sweep the red pepper sauce— and the tiniest thing on the plate makes the biggest expression of pure green spring of the night. Each dish becomes a similarly-wrapped package, where the game is to discover what the present really is. Sometimes an artist needs to work within a set of boundaries he understands exactly. Hitchcock wouldn’t have been better if he’d dabbled in westerns and musicals, he would have squandered the intense focus that makes each of his thrillers so distinctive and precise. The same is true of wishing Nugent would break his concentration on his style of plate; your reward comes to the degree that you’re willing to focus like he does. Finding Grace 2: Wine from Michael Gebert on Vimeo. Yes, you’re right, I haven’t posted lately. Needless to say there’s been lots to read at Grub Street Chicago, if you’re so inclined, and also a fair number of videos.